Shares of the global tobacco company sank as growth in its next-generation product disappointed. Check out the latest Philip Morris earnings call transcript. Shares of Philip Morris International (NYSE:PM) got torched last year, after the company said sales growth was slowing in its new IQOS product, and on an analyst downgrade at the end of the year that also timed with a sharp sell-off in the market and Altria's closing a deal with JUUL Labs. According to data from S&P Global Market Intelligence, the stock finished the year down 37%. Those losses came from two noticeable plunges -- one in April and one in December. Problems for Philip Morris started on April 19, when the stock plummeted 16% after its first-quarter earnings report came out. Though the overall numbers were solid, investors were scared off by news that growth in the company's heat-not-burn IQOS product had suddenly slowed in Japan, a key market. Management blamed the slowdown with IQOS on "limited awareness" of its increased availability, but investors saw a serious warning about the company's ability to transition away from cigarettes. The news also weighed on peers such as Altria and British American Tobacco as it seemed to signal a challenge for the entire tobacco industry. Philip Morris traded sideways for much of the rest of the year. The company delivered solid results with adjusted earnings per share up 13% through the first three quarters. However, the stock plunged again in December, starting with an 8% slide on Dec. 18 as Credit Suisse downgraded it from "neutral" to "underperform." Analyst Alan Erskine said slower progress than expected in IQOS bodes poorly for the company as the market shifts to e-cigarettes, and he lowered his price target from $92 to $74, believing the stock to be overvalued. Subsequently, Philip Morris stock fell again when Altria took a 35% stake in JUUL Labs for $12.8 billion, perhaps signaling its attention was moving away from IQOS. Like much of the tobacco sector, Philip Morris' future remains a question mark as cigarette volumes are declining, though the decline is slower than it is domestically. The company released a next-generation IQOS device in October, which took into account consumer feedback to improve on the prior device, and management is optimistic about the IQOS 3 and IQOS Multi, since the move shows it's continuing to bet on the IQOS brand to lead its transition to e-cigarettes. 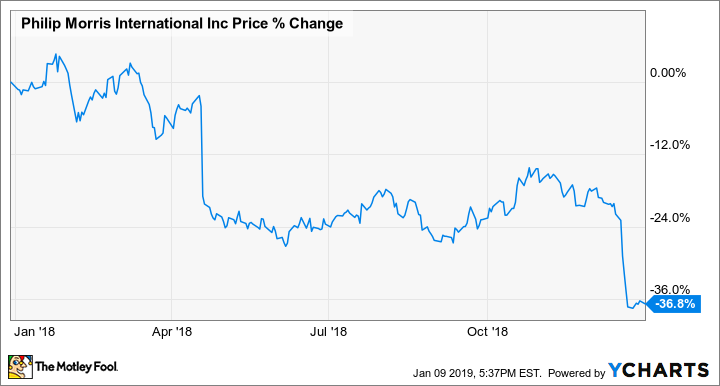 For now, investors can enjoy a 6.8% dividend yield as the stock's sell-off has elevated the dividend, but if the new IQOS product flops again, Philip Morris shares are likely to continue to slide.